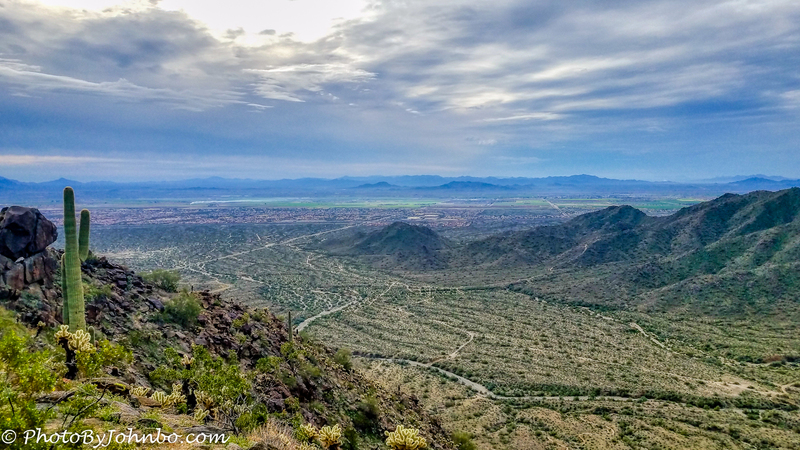 In early January, our hiking club’s weekly hike found us on a steady uphill from the nearby neighborhood known as Verrado through open desert and over a couple of ridges into Skyline Park. This popular park is only a few years old, but it has become very busy especially on winter weekends. In fact, as this is being written, I am only a couple of hours from heading to Skyline Park for a Saturday morning hike. Though I’ve hiked several of the trails in the park, I’ve avoided one of the spurs, a narrow trail leading upward from the popular Turnbuckle Trail that climbs to one of the highest peaks in the park. The Valley Vista Trail climber is rewarded with a spectacular view of parts of northern Buckeye. About the photo: This view is looking south. The long, straight road running from behind the peak on the left by the cactus toward the upper center of the image is Watson Road. The housing development that Watson Road leads to is called Sundance, and it’s where Lynn and I live in the winter. This image was processed with Aurora HDR and tweaked in Lightroom. In most browsers, you can click on the image to enlarge it for a better detailed view. The rule for Cellpic Sunday is simple, the image must be captured with a mobile device, in this case, a Samsung S7 cellphone. This photo looks even better when seen in its larger size. You should print it out and frame it! Thanks! It’s yet another example of how modern processing tools and well-designed sensors can pull amazing detail from a digital camera these days. It looks like some great hiking. Nice image. Thank you, my friend! This hike was a workout, but the payoff was the reward of beautiful views! The large version looks remarkable. The endless landscape, cell did a great job. Thanks! It’s one of my favorite views of our adopted winter city! What a beautiful view, a worthy hike for sure! hybrid! View is a powerful reward!